There's something comforting about a Squeeze record, which may not be the best critical analysis of recording artists ever but is, nevertheless, true. From a listener's point of view you are never offended or angry when a Squeeze album is playing, this is an essential skill to have when it comes to Babylon And On, as it has a lot more filler and weaker tracks than maybe a more classic release would have. 853-5937 is one of these tracks. Released by any other recording artist you like I honestly believe you be seething at the band's lack of respect for their fans and angry that such a wasteful tune made it to an album. But it's Squeeze so it's okay. Footprints, In Today's Room and Tough Love are also 'wtf' tracks and you can probably lump The Prisoner in that camp, unashamedly filler. But it's Squeeze so it's okay. Babylon And On is not a complete waste though, Striking Matches and Cigarette of a Single Man are most definitely Squeeze songs and start a strong second half of the album that also contains Who Are You and The Waiting Game. The album though is very much about its bookends. Opening track Hourglass is recognisably Squeeze in all their pomp and fits easily onto any Squeeze album, and closing track Some Americans is probably the strongest song recorded since anything on Cool For Cats. 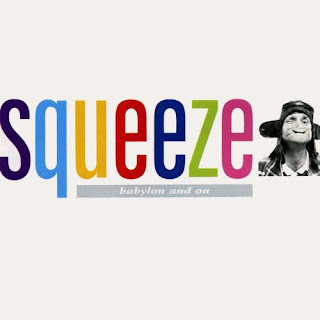 Babylon And On is not Squeeze at their best but it's comfortable. But it's Squeeze so it's okay.